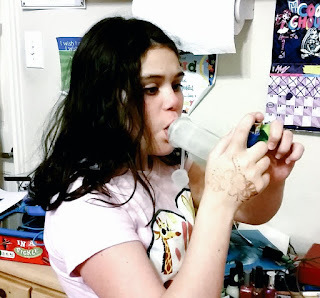 My daughter has Cystic Fibrosis. We don't talk about it much because it's just part of our lives. But it's a huge thing Cassidy deals with every day. 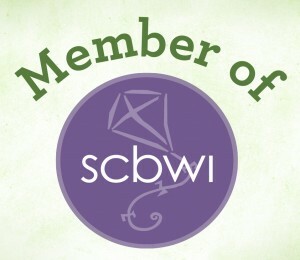 May is Cystic Fibrosis awareness month. So I decided to invite you into our lives for a day, to see what my daughter deals with because of this disease. I've tweeted much of this but there's more info in this post than I could ever add on Twitter. CF is considered a terminal illness. Children, teens, and adults still die from complications of this disease. It's a hard thing to live with, especially for a child. If you'd like more information about CF, please visit the Cystic Fibrosis Foundation for a complete description of this disease. 12:30am - Cass wakes up coughing so violently there are tears in the corners of her eyes. She can’t stop and the more she coughs, the more her chest hurts. I get up and bring her nebulizer into her room so she can do a breathing treatment. Ten minutes later the treatment is done, but Cass is still coughing. I rub her back and tell her I know. 1:10am - Cass finally stops coughing long enough to fall back asleep. 6:30am - I drag myself out of bed and wake Cass up. She has to get in two breathing treatments and some chest physical therapy on her Vest machine before school. She sits on the couch while her Vest thumps and vibrates, trying to shake the mucus in her lungs loose. Clouds of misty vapor from her nebulizer rise around her head. 7:00am - Cass gets dressed quickly, brushes her teeth and hair and then takes a couple puffs from one of her inhalers. Next is her least favorite part of the morning - I swab the inside of her nose with an antibiotic gel because six weeks ago her doctor discovered MRSA (a nasty antibiotic resistant infection) growing in Cass’s lungs and sinuses. She’s probably colonized with MRSA (meaning it will never really go away) but we have to try to beat it back, regardless. She developed MRSA because she takes antibiotics so often to combat the stream of respiratory infections she gets all the time. Each infection makes tiny scars on her lungs that will never heal. We have to treat them, but treating them sometimes means awful side-effects - like developing MRSA. 7:20am - Cass swallows eight pills with her breakfast - a high calorie concoction of milk, cream and Carnation Instant Breakfast that she despises. Unfortunately, CFers need way more calories than others their age just to maintain a normal weight. Cass’s chocolate milk mixture helps her get those calories. One of the pills Cass takes is an enzyme pill to help her digest the milk she just drank. Without that pill her body wouldn’t absorb most of the nutrients and calories from the milk and Cass would have stomach cramps and other issues in the bathroom. 7:50am - The school day starts! For a while everything is normal. But Cass can’t help coughing throughout the morning. The other kids in her class give her annoyed looks. 9:00am - Cass tries to focus at school, but she’s so tired her eyes droop and she has trouble paying attention. Nights when she wakes up coughing make for rough days at school from lack of sleep. 10:00am - Morning snack time for Cass’s class. Before she can dive into her granola bar, however, she has to visit the nurse and get an enzyme pill. Every time she eats she has to take a pill. Every time. 1:00pm - While the other kids head to lunch, Cass visits the nurse’s office first. Time to get another enzyme pill. Lunch is another bottle of the dreaded high cal milk mixture and a sandwich. 1:40pm - Everyone else is at recess but Cass sits in the nurse’s office doing a breathing treatment. This is how she always spends the first part of recess. The breathing treatment helps, but she still coughs throughout the day. This is her normal. 2:50pm - School is finally over! Cass heads for home and grabs a snack. Just a cinnamon waffle, her favorite treat lately, but that means another enzyme pill, two enzyme pills if she adds syrup and butter. The more fat and calories in the food she eats, the more pills she needs to take. 6:00pm - Breathing treatment time again. 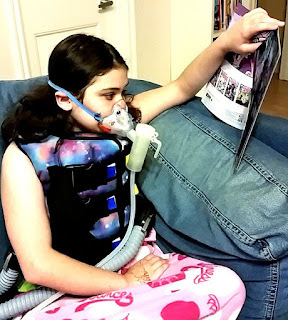 Cass sits on the couch with her Vest and does two breathing treatments while watching TV. Today it’s Teen Titans Go! She loves that show and laughs so hard she starts coughing and has to pause to catch her breath. 7:00pm - Dinner. Cass takes two pills with her dinner and for once her appetite is pretty good. She even gets seconds. Some days she barely nibbles her food. Regardless she drinks a third bottle of the high cal milk mixture. Each 4oz bottle is 250 calories and she needs every calorie she can get. We have to keep her weight up because kids over the 50th percentile on weight with CF have better lung function and we need every advantage we can get. Cass hovers right at the 50th percentile these days. 8:00pm - The usual bedtime routine begins. After changing into her PJs, Cass grabs a bag of formula her dad just mixed up and hooks it to her feeding pump. Even though she’s eating pretty good these days she can’t eat all of the calories her body needs to stay healthy. She has to be hooked up to a feeding pump at night which slowly pushes high calorie formula into her stomach through a tube in her lower abdomen. Cass has had a feeding tube since she was a year old. It’s permanent and it sticks up a bit and is noticeable under her clothing. She’s very self-conscious about it. Sometimes the other kids tease her or try to lift her shirt to see what that weird lump under her clothes is. I hug her and tell her the people who matter wouldn’t stare at all because they love her just the way she is. She gives me a scathing look but hugs me back anyway. 8:30pm - Cass takes six pills, does several puffs on two different inhalers, gets a nasal spray and then it’s time again for the hated antibiotic nasal ointment. That over, she finally lays down to go to sleep with the sound of her feeding pump whirring in the background. 10:00pm - The feeding pump alarm blares. I hurry into Cass’s room and check the machine. The line has gotten kinked as she’s been rolling around so I have to wake her up and fix the line. She mumbles a bit and falls back to sleep right away. 11:30pm - The feeding pump alarm blares again. This time letting me know her dose for the night is complete. I bring a syringe of water to flush the line and more medication. Cass wakes up reluctantly, eyes half closed and body limp. She takes five more pills, one at a time, groping for them on the bed where I’ve set them. When the last pill is down she hands me back the water bottle and flops onto her pillow. She can finally rest, for a little while. But if tonight is like the last week, she’ll wake up coughing in the early morning hours. This is a typical day. Not even a bad one. On bad days the cough won’t stop and we do breathing treatments every two to three hours day and night. On a good day Cass takes 15 different medications and swallows approximately 24 pills. On bad days she takes even more. Because of the high cost for her enzymes, next month I'll have to switch Cass from taking two different strengths of enzymes to just one - that means she'll be taking 32 pills on a good day. Once a year or so, Cass has to spend a couple weeks on IV antibiotics. It’s what CFers call a tune-up. Whenever her lung function dips and the respiratory infections start coming back to back and the cough kicks into overdrive we know a tune-up is coming. Tune-ups are hard. The antibiotics are super-charged so they’re great at knocking out nasty bugs growing in her lungs but they also leave her feeling exhausted, constantly nauseous and visiting the bathroom more often. She’ll spend a minimum of two weeks on IV antibiotics but it can stretch out to three weeks. During that time she’ll spend several hours each day hooked to an IV and she’s got a needle in her side constantly so she can’t participate in PE at school or play outside with her friends. She can’t get in the shower or take a bath and risk getting her IV dressing wet so I wash her hair in the sink and she uses a washcloth to clean her body. Cass hates IV antibiotics but we’re lucky because we get to do them at home. For many, many CF families IV antibiotics mean a two week hospital stay with the associated costs and inconvenience for everyone. Many parents struggle to keep jobs and take care of their CF kiddos when things get intense and they have to take weeks off at a time. CFers use something called a PFT (pulmonary function test) to determine how well their lungs are doing. It’s a machine that Cass has to blow air into as hard and long as she can. You or I might blow 110-120% if we’re tested. Cass consistently blows around 85% on a good day. Already, at twelve, she has irreversible lung damage and her lung capacity is lower than most kids her age. Because of CF, Cassidy is pre-diabetic. One day very soon she’ll have to add insulin shots to her daily routine. For a kid who’s afraid of needles this is a terrifying thought. CFRD (CF Related Diabetes) has nothing to do with diet. Instead, the thick mucus Cass’s body produces because of CF is slowly preventing her body from properly processing sugar and is inhibiting insulin production. Because of CF, Cassidy also has mild liver disease and has to take a medication every day to make sure her liver continues to work properly. Let’s talk money for a bit. Yes, I know money is dirty word but treating CF is expensive. One of Cass’s medications, Pulmozyme, costs $100,000 a year without insurance. With insurance it’s manageable, but the medication copays add up. In a typical month our family spends anywhere from $300-500 on medicine and nutritional supplements for CF. That’s a huge chunk of any paycheck. We manage okay, but many families don’t and quite a few have had to declare bankruptcy because of the cost of treating CF. Right now there are several promising drugs which “cure” CF. That means they fix the root cause, defective genes, but these drugs are insanely expensive and not all insurance companies will cover them. Some families have to choose between having a home and groceries or getting a medication that could save their children’s lives. Even with the “cure” CFers still have to take extra medications and do breathing treatments. It doesn’t fix everything and it can’t reverse the damage that’s already been done to their lungs. But these drugs are a huge, huge help in preventing future damage and allowing CFers to live more normal lives. The drug combo for Cass’s particular CF gene combo is still in clinical trials. There will be a cure one day. I know it in my heart. Until then we keep Cass as healthy as we can and pray she has many, many tomorrows to look forward to. If you’d like to help find a cure, please share this post, tell someone you know about CF or make a donation to the CF Foundation to help fund research & patient programs. God bless you and Cass! She is a beautiful young lady! You are an amazing mother.